Lalon koe mor ki hoe jani? And after rescuing, it is again You who reach him shore. Thus You alone I call upon! King of kings of the multiverse. Who in Your mercy made him embark. You transformed his heart and all his desires to sin vanished. Among the saints his name was inscribed in Your Book, and that is how he became know in the world. for blaspheming against the Truthful Spirit. Then again You will make them free. Lalon wonders what shall my end be? 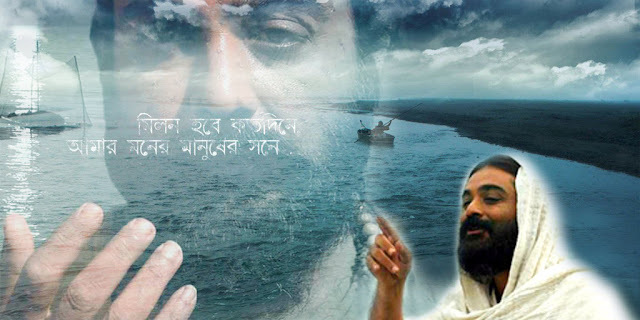 Lyrics Lalon Fakir, sung by Latif Shah for the movie Moner Mansuh (2010) | You may download the song as mp3 (for personal listening only). This beautiful song is from the Movie "Moner Manush" a movie on the life of the famous Mystic Saint and Baul of Bengal, Lalon Shah, may Allah be pleased with him. You may watch the movie in full via Youtube by clicking here. The original language of this film is Bengali and the version on Youtube doesn't have English subtitle. 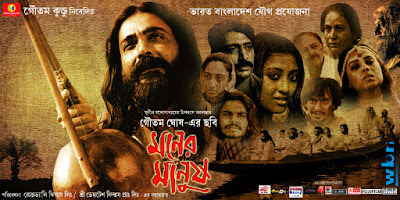 This is very well made movie made in collaboration of two countries, Bangladesh and India and captures very artistically the mystic life style of Lalon and how the flow of his life gave birth to a whole new movement for the mystics and the God intoxicated ones. + Click here to listen to other songs from the movie Moner Manush via Youtube.